Yesterday I didn’t go into work. It wasn’t because I had a lack of things to do (I have plenty to catch up on). It wasn’t because I needed to be on campus. I didn’t have any appointment anywhere in Town (Honolulu). And it wasn’t because I was sick. However, it was raining. And it was raining a lot! So much rain I feared that driving on the highway through the city would take twice as long as it normally does (approximately 20 minutes on a good day to travel 5 miles) because Hawaii drivers don’t learn how to drive in New England rainstorms. Then it would take at least another 20 minutes to go over the Likelike (it’s not pronounced like “like-like”) Highway, which crosses over the Ko’olau mountain range and drops into Kaneohe Valley. I’m certain that giant raindrops would have been pounding into my car, limiting my vision of the shear green cliffs that line the twisting road down towards Kaneohe. One hour or so later, after battling traffic lights, I would have made it to Lilipuna road, littered with potholes and huge puddles, to find myself safely in the parking lot adjacent to Lilipuna Peer. Fortunately, I am sure I would have had my long black raincoat that I normally reserve for really bad weather (my New England staple of spring and fall) and I would have thrown it on quickly before leaving my car. I would have charged faithfully down to the end of the peer, amazed that the rain was so thick that I couldn’t see my destination and bay was so brown that I vowed to not swim in it ever again, and I would have waited patiently for Bobby, the boat driver, to come take me across the channel in a small 15 foot whaler that lacks shelter of any kind. The island would have been muddy. Really muddy. I would have trenched to my office through the rain, dirt and wind, wishing the Sun was shinning like it normally does warming me on my walk around the island. Finally, upon reaching my office, I am sure I would have been productive, at least until the power went out and the Internet stopped working. And then, at that precise moment, I am sure I would have heard the dreaded clash of thunder shake the walls and lighting fill the sky. In which case, you can bet that the boat stops taking people on and off the island trapping you where you are, forced to wait out the storm in a building that should be torn down (and is crumbling in front of my eyes), with all the things that creep and crawl around the island. Now, for as beautiful coconut is, with its green trees, peaceful lagoons, bright colored reef fish and corals and its weird stringy cucumbers, you can sure bet that the last place I wanted to be yesterday, was stuck on a tiny island off an island in the middle of the Pacific ocean. That’s why I didn’t go to work yesterday. 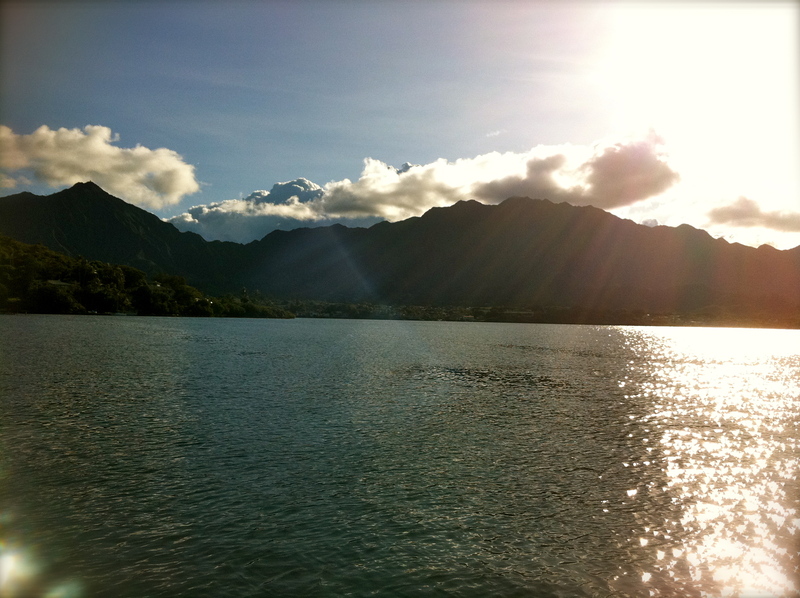 K-Bay and Ko’olaus: Doesn’t Look so bad on a nice day, huh?